Gajan & Charak Puja at Chatu Babu's Bazar ! Charak Sanyasis at Chatu Babu Latu Babu's Thakurbari. Charak Puja & Mela of Old Kolkata ! Charak sanyasis dancing with fire ! Fire dancing Sanyasis at Chatu Babu Latu Babu's Bari. Kolkata's Old Gajan Festival ! Heritage Building of Ramdulal Dey ! Kolkata's Gajan & Charak Puja ! Members of Chatu Babu Latu Babu's Family ! After Durga Puja 2015 -Bijoya Sanmellani at Chatu Babu Latu Babu's Thakurbari ! present in various important fields." Be it in Trade Commerce or Culture ! 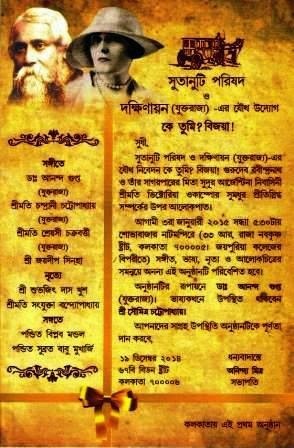 Pithe Puli Utsav at Chatu Babu Latu Babu's Thakurbari on 15th January 2012-4pm. 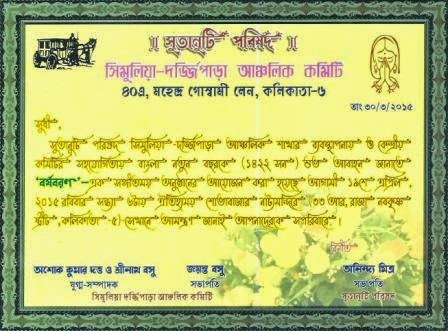 Cultural Programme at Sovabazar Nat Mandir on 10th March 2012-6pm. Sutanuti Parishad presents Indian Music & Dance. 26th & 27th April 2012 at 6.30pm. Nat Mandir on 6th May 2012 at 6pm. Ashutosh Laha Bati at 6pm. Sutanuti Parishad's Inter School Competition 'Utkorsho'on 23rd August 2012. 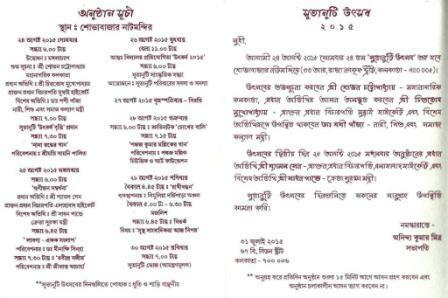 Cultural Programmes on 24th & 25th August 2012. Sutanuti Bhog on 26th August 2012. 6th Oct'12 (Saturday) at Sovabazar Nat Mandir at 6pm. Sutanuti Parishad organizes a get together on 24th Nov 2012 at Thanthane Rajbati at 6pm. 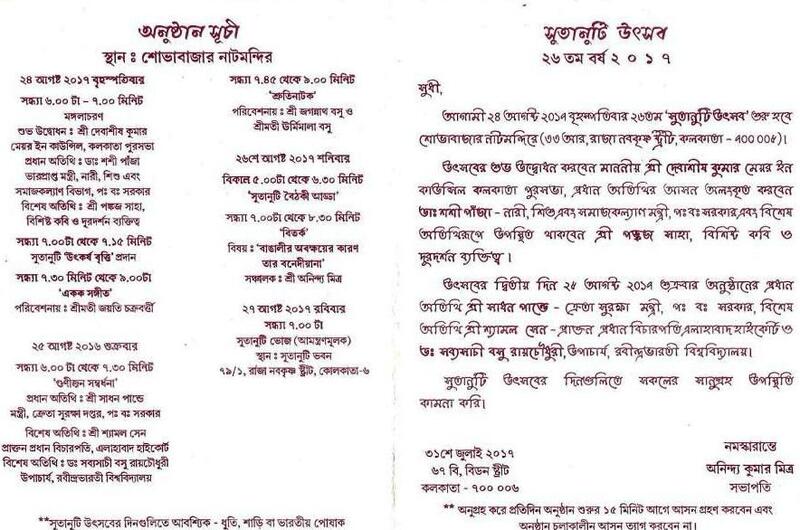 Pithe-Puli Utsav by Sutanuti Parishad on 13th Jan 2013 at Chatu Babu Latu Babu's Thakurbari. at Sobhabazar Nat Mandir at 5.30pm. 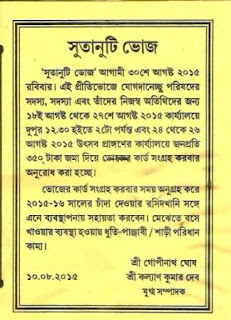 Sutanuti Parishad presents 'Jiboner Jol Chobi'. Katthak & Thumri in old & traditional Mehfil style. On 31st March 2013 at Sovabazar Nat Mandir at 6.30pm. Latu Babu;s Thakurbari on 7th April 2013 at 6.30pm. Values' by Sanjib Chattopadhyay. At Sovabazar Natmandir on 30thApril '13 at 6PM. 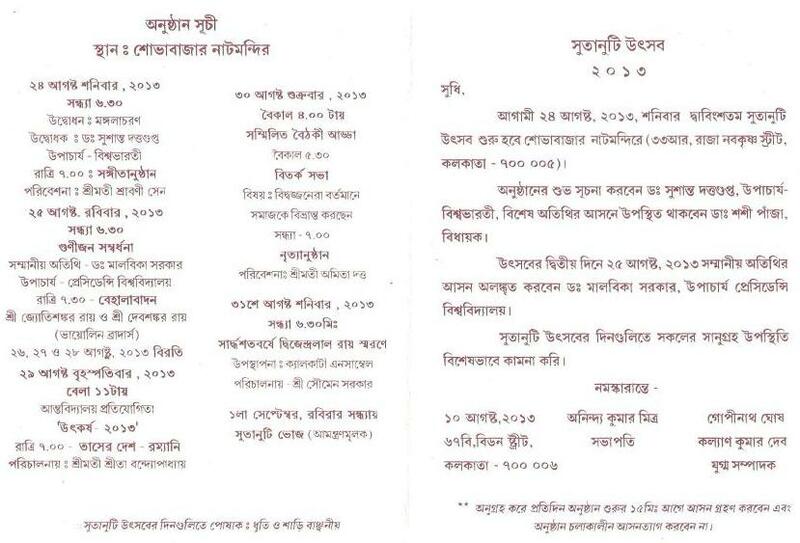 At Chatu Babu Latu Babu's Thakurbari on 21st August '13 at 6pm. At Sovabazar Nat Mandir. 6.30pm..
Rana,Mohona Ganguly,Deb Prashad Chakraborty,Sweta Banerjee. Anchors: Srita Banerjee & Joyeta Basu. Pithe Puli on 12th Jan'14 from 4pm onward. Sovabazar Nat Mandir by Sutanuti Parishad. Gupta & othrs from London. Classical Music on 11th Jan'14 at Laha Bati at 5.30pm. Shovabazar Nat Mandir on 10th August 2014 Sunday from 6pm. 8th November 20014-Bijoya Sanmilani at 5.30pm at Thanthania Rajbati. 4th January 2015: Milan Mela (Subscription Rs400/-)Ph.9830572047,9836943364. 18th January 2015 : Musical Soiree at 50A Kailash Bose Street-5pm. 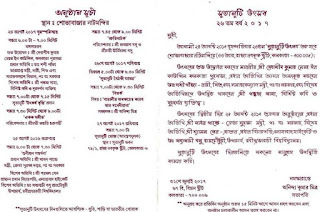 29th March 2015: Basanta Utsav(Sukea Anchal) at Shovabazar Nat Mandir-6.30pm. 19th April 2015: 'Borshoboron' by Simulia Darjeepara Anchal at Shovabajar Nat Mandir-6pm. 16th May 2015 : Song by Sabita and Antara Chowdhury at Birendra Mancha-6pm. 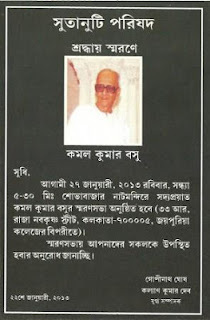 30th May 2015 : Kamal Basu memorial lecture'Changes in social & cultural life of Bengalis in last 50yrs' by Sri Rudra Prasad Sengupta.At Sovabazar Natmandir-6PM. 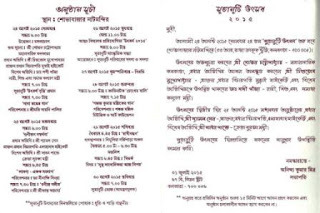 12th July 2015: AGM by Darjipara Simulia at Anath Nath Deb's (Chatu Babu Latu Babu's Thakurbari) at 6pm. 11th October 2015: Shyampukur Anchal will present DOHAR at 6pm. Mandal,Dr.Ananda Gupta etc at5.30pm.Venue-Sovabazar Natmandir. Kushal Das(Sitar).Tabla:Arup Chatterjee,Sanjay Adhikary,,Sanjay Mukherjee. 16th March 2016: Basanta Utsab at Thanthania Rajbati ( Sukea Anchal ) at 6.30pm. Fihre Elo, Sakhaproshaka, Agontuk etc.on screen-6pm. 18th August: Simulia Darjeepara"s Rakhi Bandhan Utsav. Kirtan by Arati Pal. At Chatu Babu Latu Babu's Thakurbari (A.N.D. Trust)-6pm. Latu Babu's Thakurbari (A.N.D. Trust Estate)- 2pm-8pm. 14th January 2017 : Simulia Darjipara Anchal's "Pithe Puli Utsav".At Chatu Babu Latu Babu's Thakurbari (A.N.Deb's Thakurbari).-4pm onwards. 29th January 2017 : Reminiscence meeting on Late Dipak Krishna Mitra at Federation Hall-6pm. Sarwar Hussein (sarenghi). 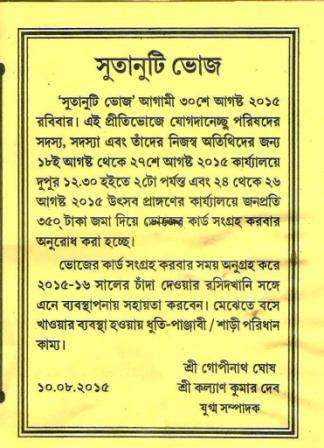 By Simulia Darjeepara Anchal at Sovabazar Natmandir-6pm. 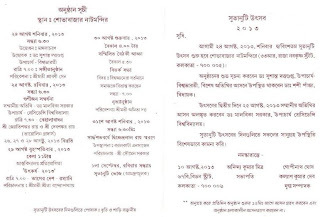 18th March:A documentary film " Sur-O-Sutanuti" by Chorbagan Anchal at Mitra Bati-6pm. 14th May:Shyampukur Anchal remembers Purnendu Sengupta. Sandip Ray & Lalita Ray will speak about Satyajit Ray.Ambar Chakraborty will perform Ray's songs.Vocal Rusti Ray , Rupa Sarkar. At Sovabazar Natmandir-6.30pm. (Chatu Babu Latu Babu) Thakurbari. 2pm. 10th March : Chorbagan Anchal organizes workshop on appreciation of Indian Classical Music.At 46 Pathuriaghata Street.Kolkata-6 at 5Pm. 24th-26th August 2018 :Sutanuti Utsav. 24/8-5.45Pm, 25/8-5.45 Pm, 26/8-5.15Pm. At Sovabazar Natmandir with Indian Dress. 10th November 2018 : Shyampukur Anchal's Cultural Evening with variety program by noted personalities. 24th November 2018: Chorebagan Anchal's Vijaya Sammilani. At the ground of Pastur Laboratory. Bidhan Sarani, Kol 6-5.30pm. 9th January 2019 : Sutanuti Parishad & Dakshinayan (UK) presents Soumitra Chatterjee & Dr. Ananda Gupta's team. At Sovabazar Natmandir-6 Pm. Chicken Hotch Potch & Tradition ! Catch them by ears-For Vote ! Gaurd your secret informations ! Chatu Babu & His Musicians. Beehive at Beadon Street ! Ramdulal De & 18th Century Caste System ! The Great Atlantic Treasure ! Google Analytic Tracking Code ! Durga Puja Adda 2011 at Chatu Babu's House !